To send a file in a one-on-one or group chat, click Choose file beneath the compose box, select the file you want to share, and then send. You can also upload a file by going to the Files tab and clicking Share. 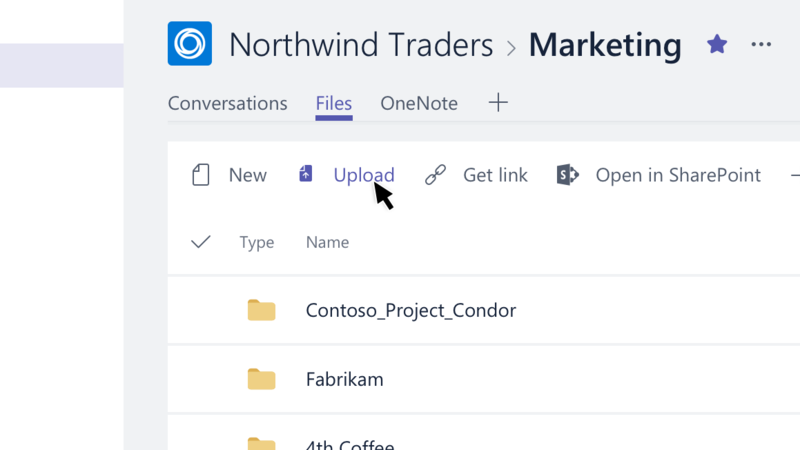 You can select a file from your computer or OneDrive for Business account. To share a file with your team in a channel, click Choose file beneath the compose box or go to the Files tab and click Upload. Once you share a file, you can also share a link to it. That way, you don't ever have to upload multiple copies of the same file to share it in different places. To attach a file to a channel conversation or a chat, tap Choose file in the compose box and then select the file from your device or a cloud storage service. When you attach a file in a channel conversation, the file is saved to the SharePoint location for the team channel. When you attach a file in a chat conversation, the file is saved to your OneDrive and accessible to all members of that chat. You can view the team's files that were attached to channel conversations by selecting Tabs > Files. You can upload files in the desktop or web app, and view them on your mobile device any time after that. You can see your recent files on SharePoint by tapping More > Files. From there you can select OneDrive and tap More options in the header to open and use your OneDrive app to upload files.